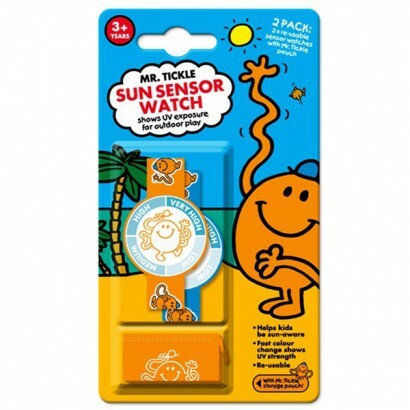 This pack of 2 sun sensor watches is a handy guide for UV ray strength and changes colour with increased sun exposure to help kids understand safe sunny outdoor play. Makes a great gift that is fun for kids to wear as has Mr. Mens Mr. Tickle picture but also has a very practical use of warning kids and parents when the sun is too strong so to wear increased factor sunscreen or to seek shade. Great for kids holidays, festivals, or just general outdoor sunshiney play. Please note this is not a timepiece, it's called a watch as it's worn around the wrist.